The Century 21 Exposition is better known as the Seattle World's Fair. The highlights of the fair were the Space Needle and the Alweg Monorail. The Space Needle features an observation deck at 520 feet (159 m), a restaurant, and a gift shop. The downtown Seattle skyline, the Cascade Mountains, Mount Rainier, Elliott Bay and its surrounding islands can be seen from the top. The Monorail is an elevated train that runs one mile along Fifth Avenue from Westlake Center in downtown to Seattle Center in Lower Queen Anne. It claims to be the "only fully self-sufficient public transit system" in the United States, and with a top speed of 50 mph, to also be the fastest full-sized monorail in the country. One of the concept cars on display at the fair was the 1958 Firebird III, which, aerodynamically at least, considerably out-classed the Avanti! The fair opened in early 1962 and the production model 1963 Studebaker Avanti made its first public appearance in April at the New York International Auto Show. GM's 1958 Firebird III concept car was exhibited at the 1962 Seattle World's Fair. 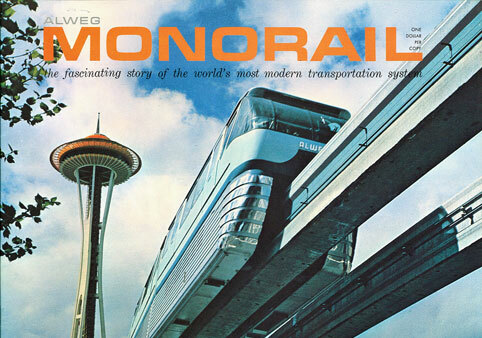 Alweg Monorail - The fascinating story of the world's most modern transportation system. 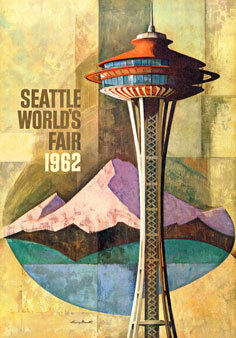 The Space Needle on the cover of a 1962 Seattle World's Fair guide.